In 2015, the United Nations (UN) developed a set of 17 Sustainable Development Goals (SDGs) to mobilize governments, businesses and communities to develop cross-sector solutions to the complex and urgent environmental, social and economic challenges facing our world. In 2016, the Board's Sustainability & Citizenship Committee initiated a process to determine how to align our organization to the SDGs. 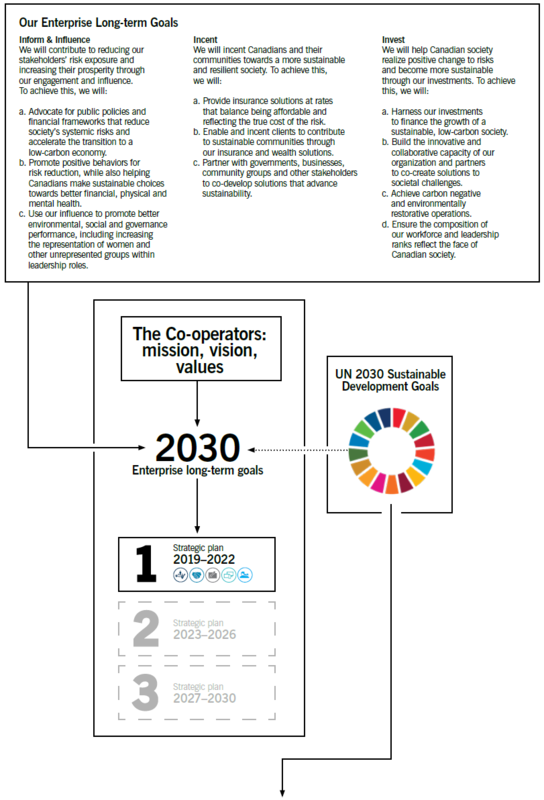 In 2018, our Board endorsed all 17 of the SDGs, as reflections of our co-operative values. Further, a decision was made by the Board and management to focus our resources on nine SDGs on which we have the greatest expertise and can make the most meaningful impact. We've designed our 2030 Enterprise Long-term Goals in alignment with the SDGs, linking our strategic priorities with a collective global effort to protect the environmental, social and financial well-being of current and future generations. Check out the UN SDG website to find out how you can take action to support this global effort. If you have any questions related to our contributions to the SDGs, contact the Sustainability & Citizenship department.